PINOY COOKING AT PIYESTA PINOY! For the fourth year in a row, the Village of Bolingbrook is hosting Piyesta Pinoy, the largest Filipino-American festival in the Midwest, gathering an average of 7,000 visitors. One of the highlights of the day-long event is a series of cooking demonstrations of Filipino dishes by highly accomplished Filipino-American chefs. The June 10 event also showcases Philippine music, arts and culture, kicking off with a Parade of Costumes at 11:00 a.m. 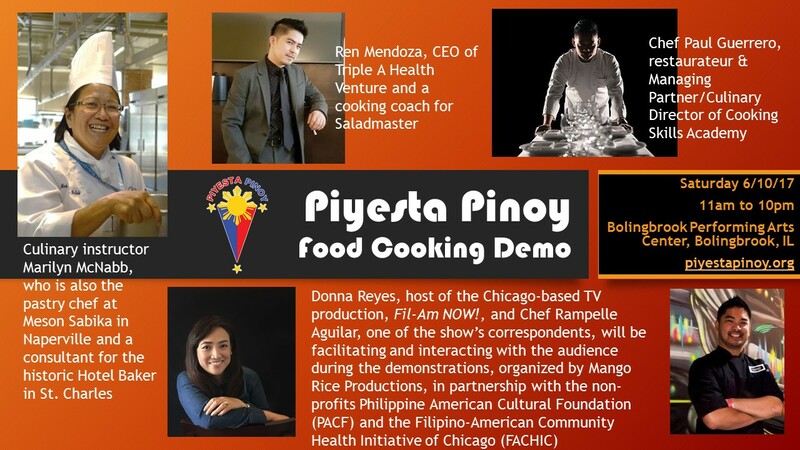 If you want to introduce your heritage to your non-Filipino friends or co-workers, inviting them to this year’s cooking demonstrations at the Piyesta Pinoy may be the perfect opportunity. “Pinoy na Pinoy” is the theme for this year’s cooking demonstrations, featuring authentic Filipino dishes. Chef Paul Guerrero, Culinary Director of Cooking Skills Academy, the largest recreational cooking school in Chicagoland, opens the cooking demonstrations at 1:15 p.m. with his favorite recipe of Chicken Bicol Express, a spicy specialty dish from the Bicol region traditionally made with pork, simmered in coconut milk, chili peppers and shrimp paste. At 4:15 p.m., Ren Mendoza, CEO of Triple A Health Venture and a cooking coach for Saladmaster, is scheduled to prepare his no-oil Lechon Kawali (pork belly that is typically deep fried) paired with atchara (a concoction of shredded pickled vegetables). Culinary instructor Marilyn McNabb, who is also the pastry chef at Meson Sabika in Naperville and a consultant for the historic Hotel Baker in St. Charles, winds up the demonstrations at 7:15 p.m. with her version of Bibingka, a rice cake traditionally served during Christmas and other holidays in the Philippines. 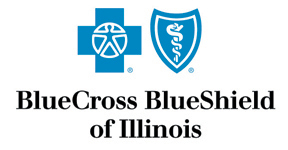 The cooking demos will be held at the Mindanao/Three Horses Jasmine Rice tent across the main entertainment stage of the Bolingbrook Performing Arts Center located at 375 W. Briarcliff Road in Bolingbrook. The event is also made possible by the support of Saladmaster, Opulence Skin Care, Indomie Noodles, Penny’s Spa, WET USA / WET International and other sponsors. 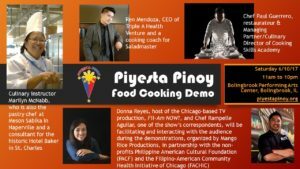 Donna Reyes, host of the Chicago-based TV production, Fil-Am NOW!, and Chef Rampelle Aguilar, one of the show’s correspondents, will be facilitating and interacting with the audience during the demonstrations, organized by Mango Rice Productions, in partnership with the non-profits Philippine American Cultural Foundation (PACF) and the Filipino-American Community Health Initiative of Chicago (FACHIC). 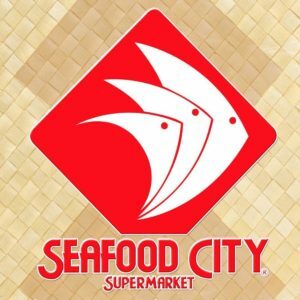 Aside from free tasting of the dishes prepared during the demos (available on a first come, first serve, while supplies last basis), give-aways, gift certificates, and recipe booklets will be given to lucky members of the audience. Piyesta Pinoy is an annual celebration which highlights the heritage and culture of the Philippines. The festival draws thousands of people, mostly from Fil-Am communities all over Illinois and neighboring states. Admission is free.